Have you considered teaching at the college level? Consider bringing your expertise to Thomas Nelson Community College. As the college expands to serve the educational needs of our communities, Thomas Nelson is seeking qualified instructors in a variety of fields and curriculums both for credit and workforce training programs. Many of our part-time instructors are businessmen and women, military members and other professionals who share their real world work experience with the students. 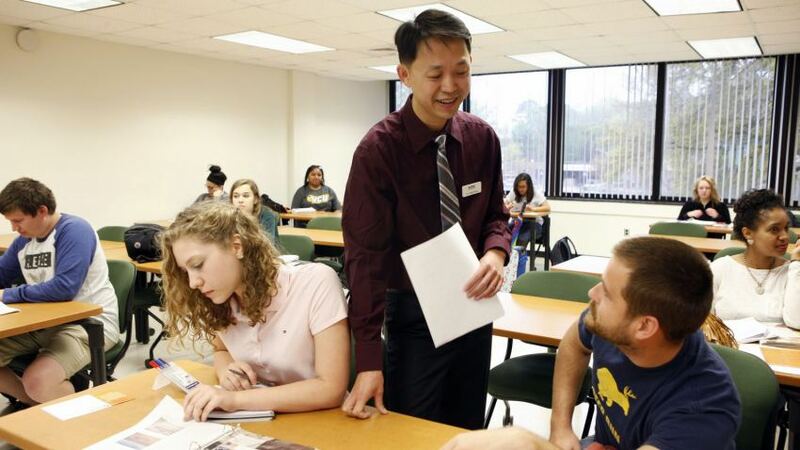 In addition to daytime and evening teaching opportunities, adjunct faculty members may participate in professional development activities and college-wide social events. They also have a Thomas Nelson email account, access to printing and audiovisual services and are provided instructor orientation and support. Thomas Nelson is a two year institution of higher education established in 1967 as a part of Virginia’s statewide system of community colleges. It primarily serves the residents of the cities of Hampton, Newport News, Poquoson and Williamsburg and the counties of James City and York. The college is accredited by the Commission on Colleges of the Southern Association of Colleges and Schools and has been approved by the VA and the US Office of Education for various federally funded programs. If you are looking for a fulfilling way to share your education and experience, consider a part-time career as an instructor at Thomas Nelson Community College. Instructors must have at least a master’s degree with 18 graduate semester hours in the discipline. Subjects include accounting, biology, chemistry, computer science, engineering, speech, English (developmental reading and writing, college composition, literature), health/physical education, humanities, philosophy, religion, foreign languages, studio arts, art history, mathematics, music appreciation and physics. Instructors must have at least a bachelor’s degree in the discipline and at least 2 years of related experience. Includes subjects such as drafting, electronics, electricity, information systems technology, photography, sign communication, nursing, computer arts and medical lab. Salary is $553-925 per credit hour based on credentials. Workforce training encompasses a variety of programs for individuals and for businesses to enhance occupational skills or increase personal and professional effectiveness. Qualifications for instructors vary according to subject; a degree may not be required. Salary is $25-30 per hour based on credentials and student enrollment. Cover letter and resume detailing your teaching experience and / or qualifications for teaching a particular subject. Please note: Before applying for positions, please read the application process as the instructions may vary. Faxed, paper or e-mail application packages will not be accepted. We will only accept and consider applications for current openings listed on the Virginia Jobs site. Please call (757) 825-2728 for additional information or for assistance with submitting your electronic application through the Virginia Jobs site. Commonwealth of Virginia employment application including three references. Application is available at the Virginia Jobs site at http://jobs.virginia.gov. Cover letter and resume detailing teaching experience and / or qualifications for teaching a particular subject. For additional information, call (757) 825-2937 or (757) 825-2935.